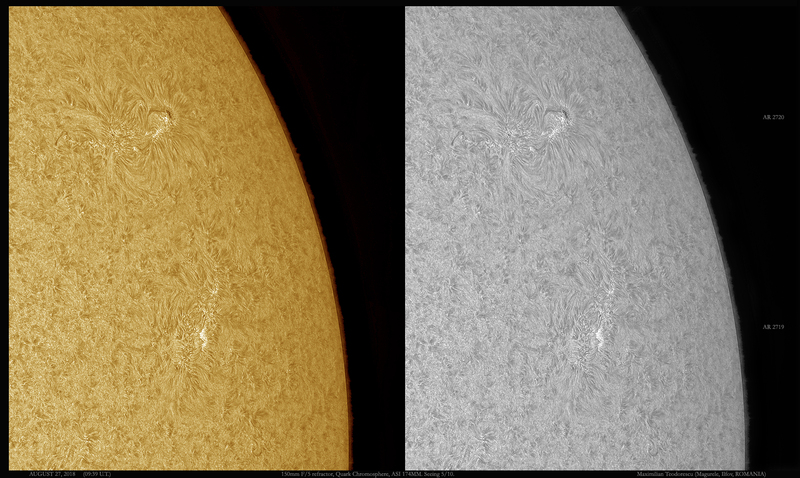 Some nice activity on the Sun today, including one fairly large protuberance. I’ve decided to place most of my images of the Red Planet onto a single canvas. It just might happen that the image from August 25 might be my last of this opposition, so a retrospective of the opposition was in place. 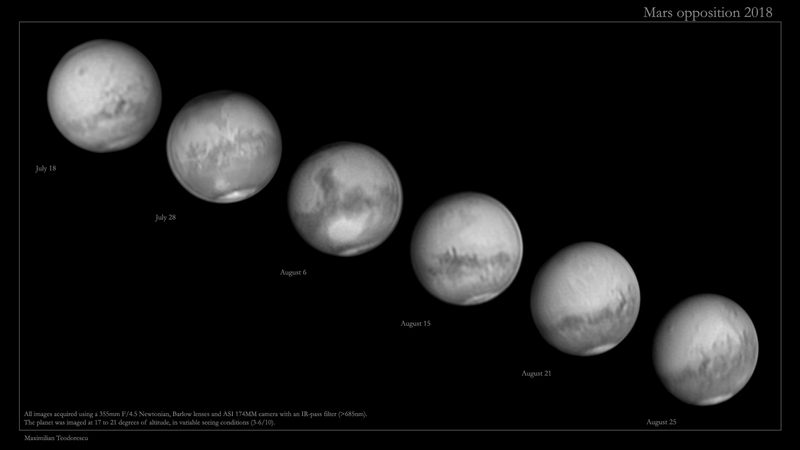 The great dust storm that had a global effect on Mars, changed a lot some albedo features, and this is apparent in the first and last shots of the sequence, with Solis Lacus changing the appearance dramatically. I’ve selected only the infrared images, since the RGB sequences were too different and poor in quality. Despite the low altitude of the planet, the July 28 session was trully memorable, with excellent seeing higher in the sky, and good for 20 degrees; thus a lot of details are detectable in the July 28 image, including the Valles Marineris canyon. 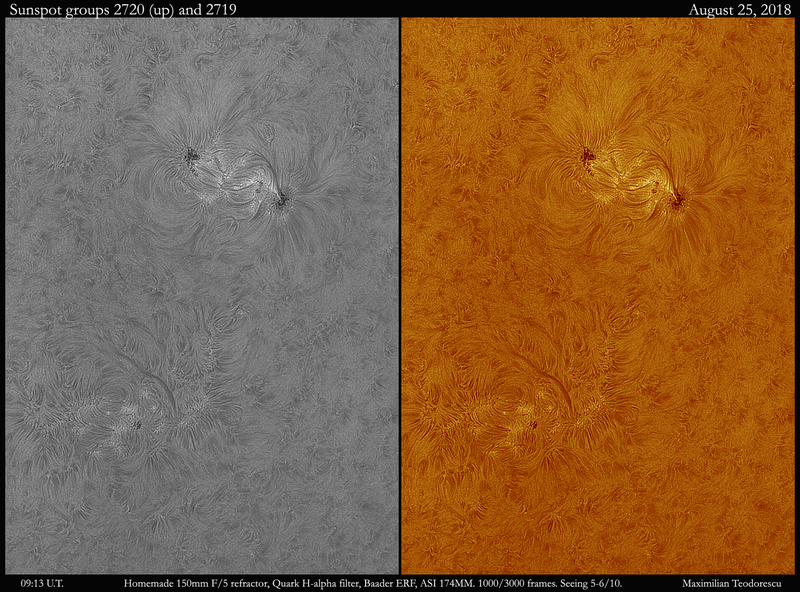 Some H-alpha activity today on the Sun, with two sunspot groups, one of which is rapidly evolving. 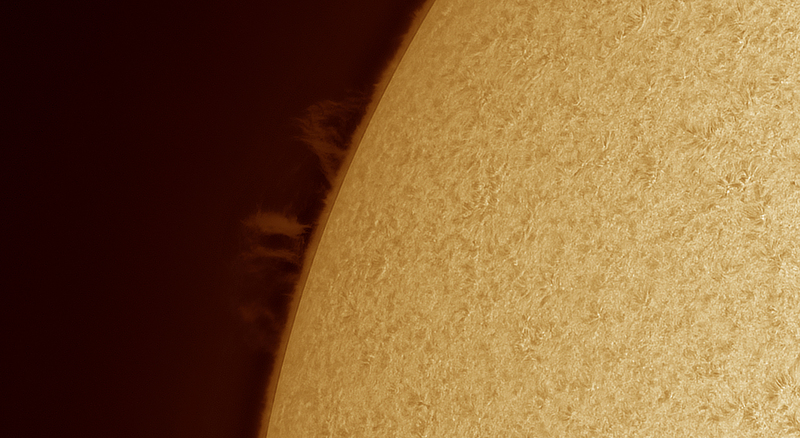 A complex looking prominence is seen. 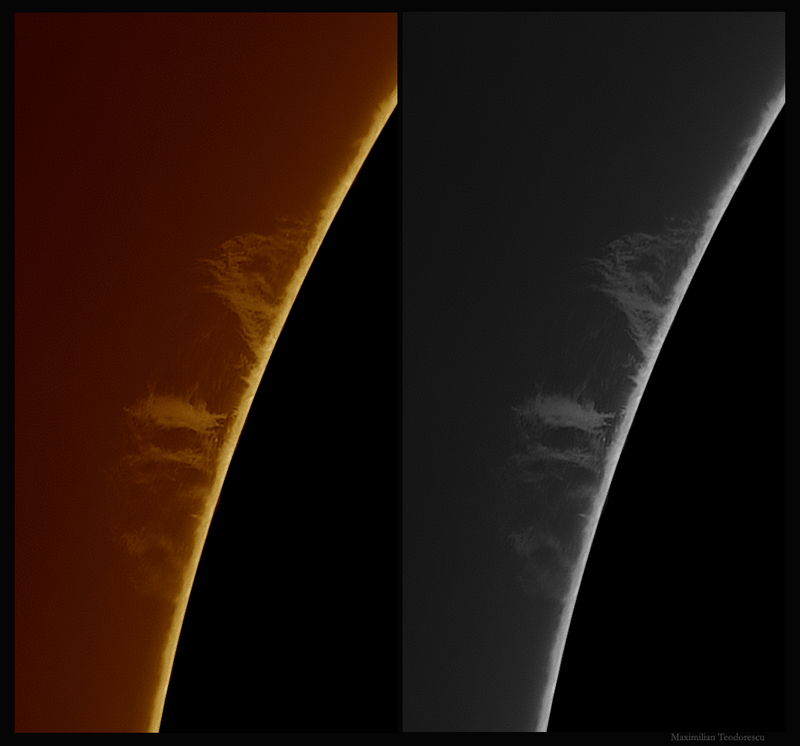 Equipment: 150mm F/5 homemade refractor, Quark H alpha filter, Baader ERF 50mm, ASI 174MM. Mars under good seeing conditions for the altitude. 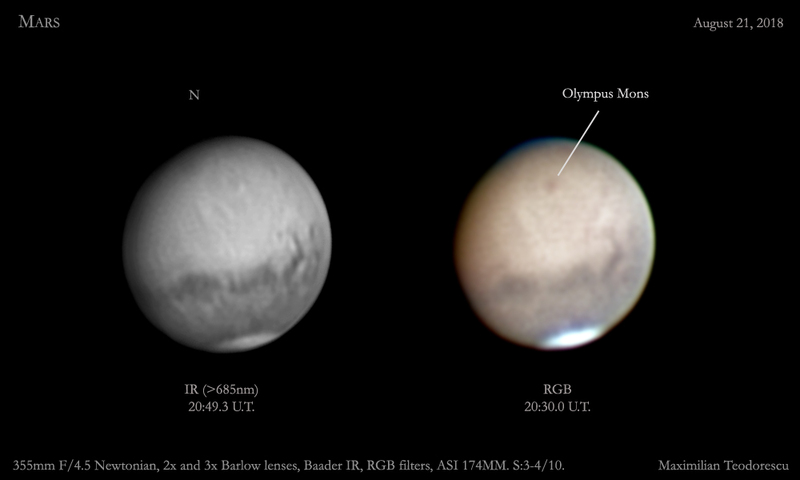 Some nice details are observed, including Olympus Mons. The storm is definitely over in this region, at least in the IR part of the spectrum. Well, on August 21 the seeing was fantastic but the Moon was at around 20 degrees of altitude. 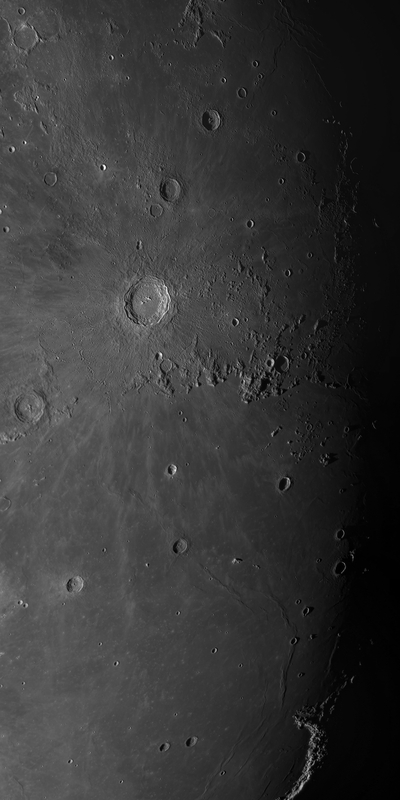 Nevertheless I was determined to image some lunar craters. And, despite the very low altitude of our satellite, some interesting details are detectable on the image below. Equipment: 355mm Newton, ASI 174MM, Red filter. Seeing for the Moon: 3-4/10 (but at 20 degrees that is pretty much fantastic!). Another solar transit occurred today. I was very lucky to image the ISS during a small opening in the clouds. 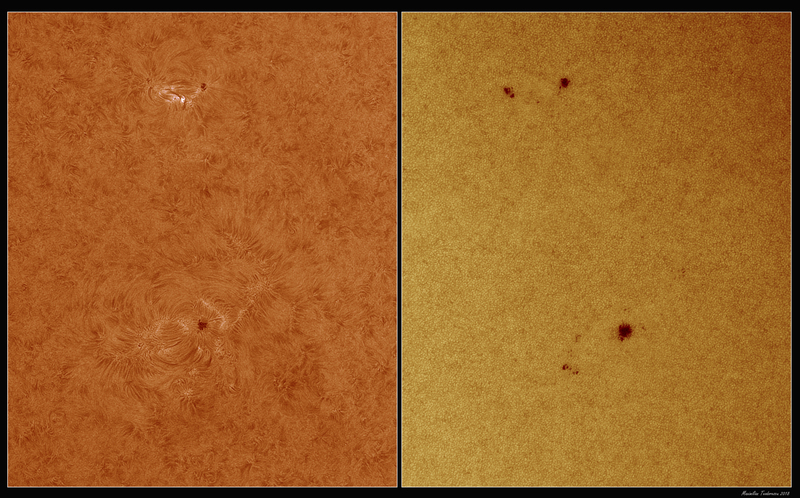 The seeing was not great but the solar granulation is discernible, as are a few structural details of the Station. 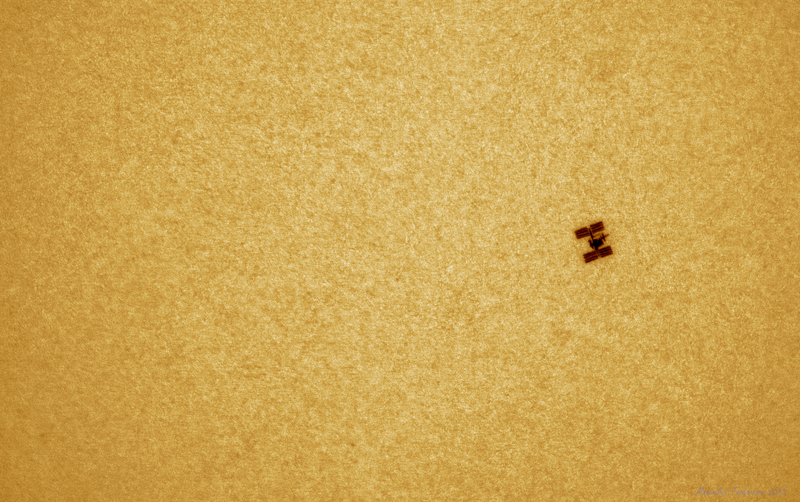 Note also the small sunspot. 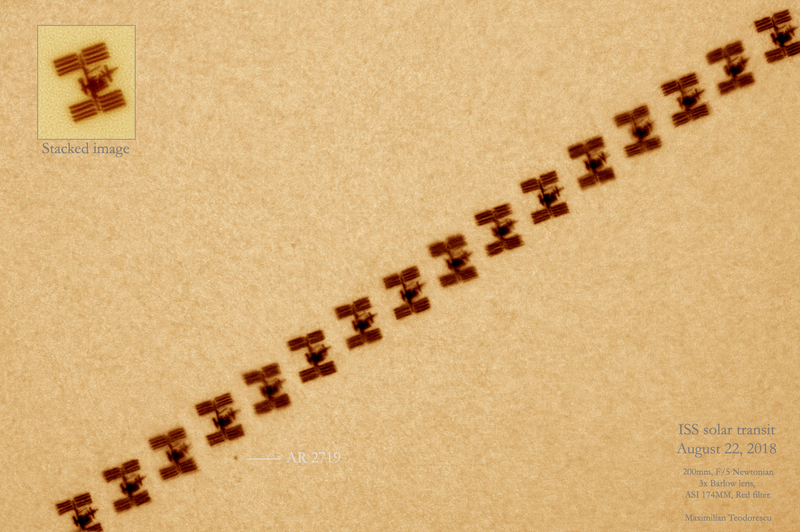 The inset on the sequence image is made from staking all the frames acquired with the ISS. A single processed frame is also shown. Prediction of the transit via Calsky.